Your Challenge: Keep your far-flung facilities compliant with dozens of different state employment laws. BLR’s Solution: The only at-a-glance reference volume that explains employer obligations under 50+ employment laws, for each of the 50 United States. 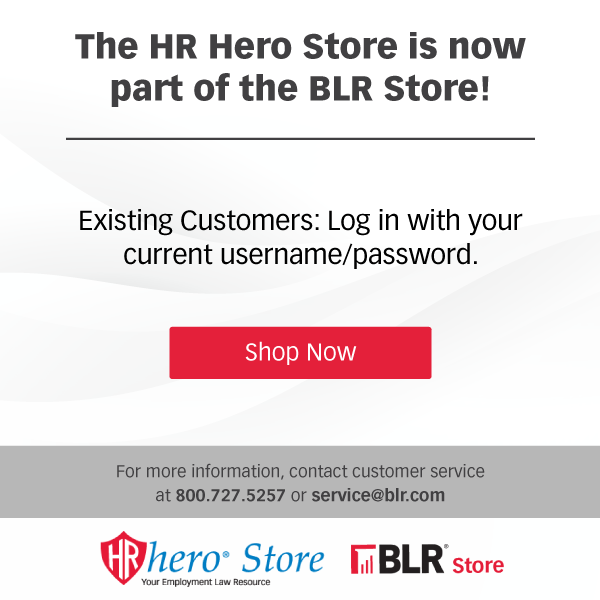 The annually updated 50 Employment Laws in 50 States is a BLR best-seller for one simple reason – it saves hours of research for HR professionals and employers who have to comply with employment laws in more than one state. Whatever the question you get from a front-line supervisor, a field office, another executive, you’ll find the answer in seconds. Clear side-by-side comparison charts tell you in one or two sentences what your policies and practices must contain to avoid the attention of state labor department watchdogs and aggressive plaintiff’s attorneys. From Alabama to Wyoming, we’ve done the research to uncover employer rights and obligations on everything from family leave to disability accommodations to drug testing to meal and rest breaks. Over 50 areas of employee management are covered, giving you everything you need to make smart decisions and policy recommendations. Buyers' Benefit: You are enrolling in an automatic update program and will receive annual updates sent on a 90-day approval basis and billed separately. You may cancel this automatic update program at any time. Now you can INSTANTLY discover your legal obligations under the 50 most important employment laws in each of the 50 states. 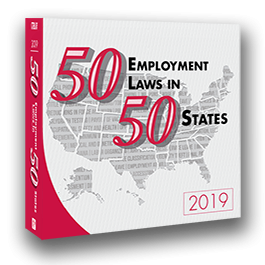 50 Employment Laws in 50 States, 2019 Edition is the revolutionary guidebook that puts ALL the most need-to-know employment law information — for each of the 50 states — right at your fingertips. Advise colleagues at field offices, branches, and stores. This quick-reference guide puts the expertise of the nationwide Employers Counsel Network right at your fingertips. The top-flight attorneys in the Network focus almost exclusively on defending employers and write the Employment Law Letter for their state. They have applied their valuable time and resources to making this side-by-side comparison of employer obligations the definitive reference. 50 Employment Laws in 50 States is prepared by leading attorneys, many of them members of the Employers Counsel Network, a nationwide affiliation of prestigious law firms representing management in employment law matters. Their contributions are edited by Celeste Duke. 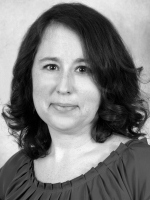 Celeste Duke, SPHR, is the Editor of a number of BLR publications. She has written about human resources for a variety of publications, including Basic Training for Supervisors and Frontline Supervision. She has written and edited a series of white papers covering employment trends and developments and manages the editorial content for BLR’s online training. Before coming to BLR, she was the business editor for The Daily Herald in Columbia, Tennessee. Celeste earned her bachelor’s degree from David Lipscomb University and a master’s from Middle Tennessee State University, where she also taught writing. Following is a list of those who were most instrumental in the completion of this book. We thank them for their continued perseverance in this project. Alabama: Lehr Middlebrooks & Vreeland, P.C. Arkansas: Jack Nelson Jones, P.A. Idaho: Greener Burke Shoemaker Oberrecht, P.A. Maryland: Whiteford, Taylor & Preston L.L.P. Massachusetts: Skoler, Abbott & Presser, P.C. Michigan: The Murray Law Group, P.C. Nebraska: Erickson | Sederstrom, P.C. New Hampshire: Sheehan Phinney Bass & Green PA.
New Mexico: Kelleher & McCleod, P.A. South Carolina: McNair Law Firm, P.A. South Dakota: Lynn, Jackson, Shultz & Lebrun, P.C. Vermont: Dinse, Knapp & McAndrew, P.C. GUARANTEE: Your 100% satisfaction is guaranteed. If for any reason you are not completely satisfied with 50 Employment Laws in 50 States, simply let us know within 90 days of your purchase, and we will issue you a complete refund.